Finally, we are moving the end of June. 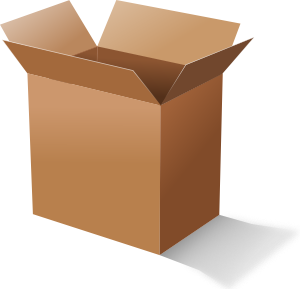 Moving = Packing. Ruttiger... The baby is growing! 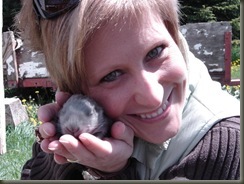 A friend and I went to visit the baby wabbits up at the farm last weekend... sorry it took so long to share the photos! 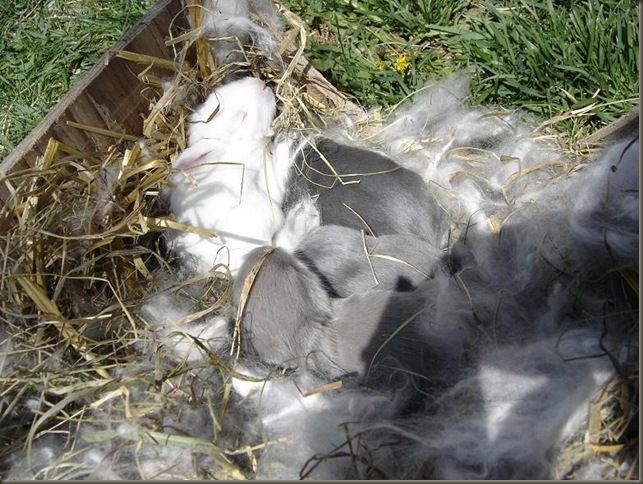 These little furbabies are English Angora rabbits... one of whom I will be adopting around the first of July! The litter had 6 little ones - the runt didn't make it... so there are 5 babies peeping around the nest box. 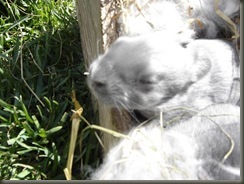 The breeders want to keep the white one, and there are 4 other grey ones for me to choose from. At this point since they are so small yet, and their coats are still growing in, it is still impossible to know what they will look like as adults. 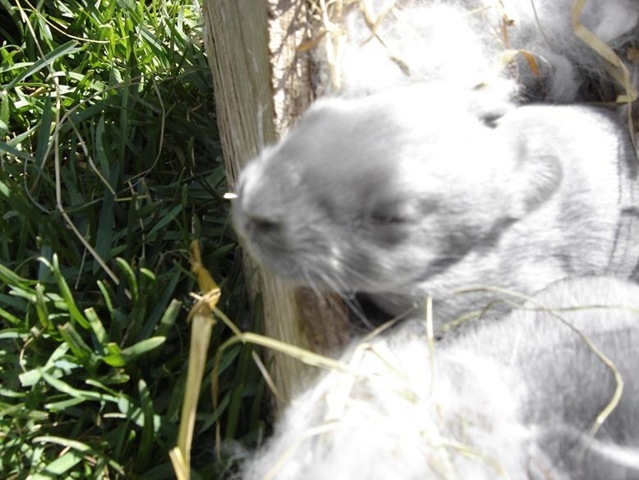 Two of the grey babies are light in color, and the other two are slightly darker. 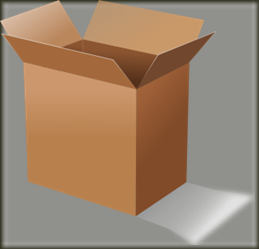 <-- This little guy kept poking his little wiggly nose out of the box to sniff the springtime air and check out the lawn. I think the babies must have recently fed, because their little bellies were round and full and warm. They didn't seem to mind being held at all, and their Mom "Reba" was not upset by the fact that were were handling them either. This is her second litter of kits since Melvin and Lorraine got their pair. 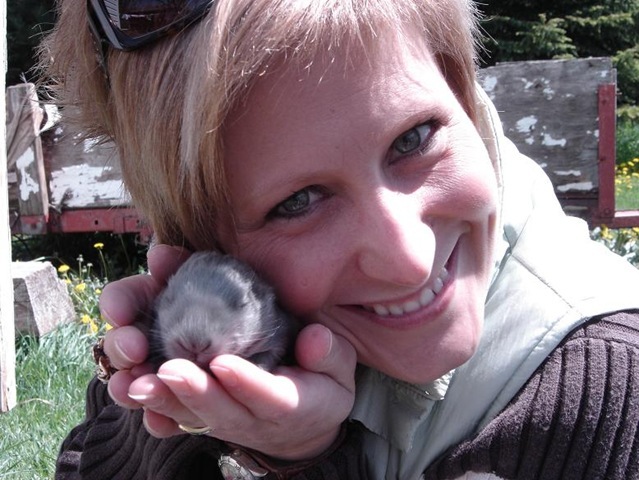 For someone who doesn't want a rabbit... my Friend S was getting pretty cozy with a little grey one! I think there might be another rabbit lover in the making here! I was so excited about petting and holding the little guys that I almost forgot to take any photos! In fact I went back to the car about halfway through the visit to get it, after having forgotten completely that I had promised to show pictures! 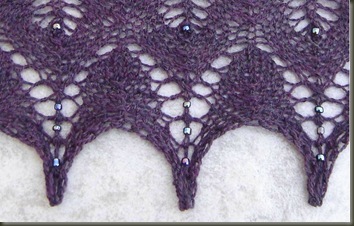 The Shetland Triangle has been a quite enjoyable project... beads included. The tiny crochet hook was very easy to use, and even the beaded rows flew along at reasonable speeds. 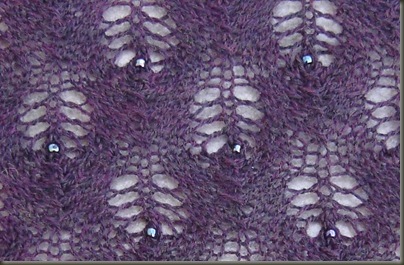 I decided that the shawl didn't need all-over bling, but perhaps just the last few pattern repeats. After some deliberation, I choose to add them to row 9 (the mostly plain knit row of the 10 row repeat) and then to bead the very points of the border with 3 beads on each point, and the centre one of course. The beads themselves seem to match in quite nicely. At first I wasn't sure if the slightly rainbow essence would match the Plum yarn, but I think that they compliment the shawl more than a plain flat black bead would have. I actually found these beads by accident while shopping at Michael's - they were part of a premade necklace with multiple strands of beads. There were strands of plain black shiny seed beads, several of these "e" beads that I used for Shetland Triangle, some silver metallic looking "e" beads, and finally some black "e" beads that have the look of hematite. I bought the whole necklace for 99 cents... and I only used one strand for this piece! I'm sure I will find something else to do with the rest at some point. 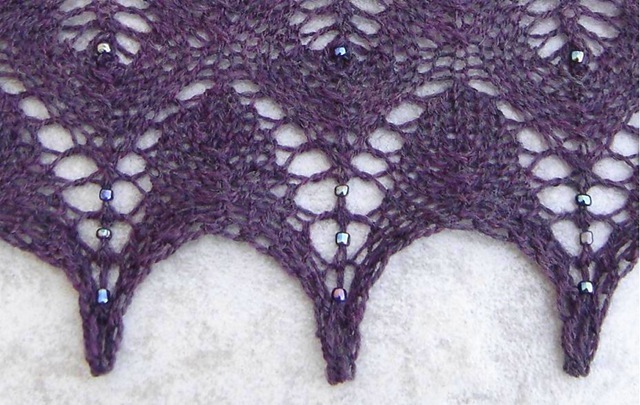 In the end I worked 2 more repeats of the initial lace pattern than the instructions called for, and surprisingly enough, I managed to use only one skein of the KnitPicks Shadow Lace that I had. 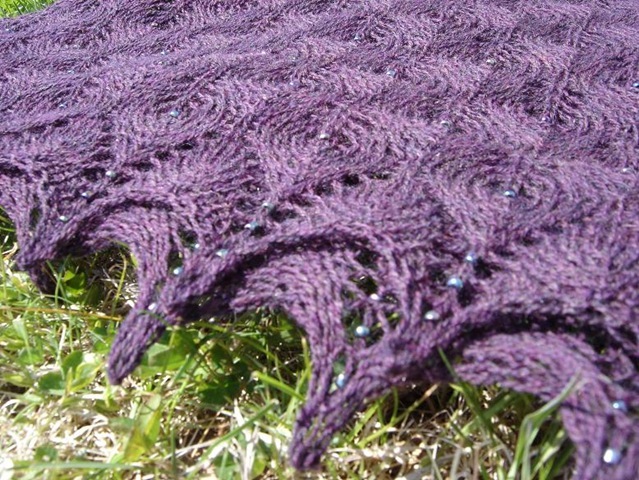 I wanted this to be large enough to wrap comfortably around the shoulders, but I don't really know the recipient that well, so I wasn't sure she would want a really huge overpowering shawl. I think I reached a decent happy medium on size. This also means I have enough yarn to make another of these... maybe for me, since I am feeling undecided about giving this away. I think that's usually how I know I did a good job... if I like the item well enough to keep it myself, it's likely nice enough to be giving it away to someone else? When I was knitting this up... using the prescribed sized needles... 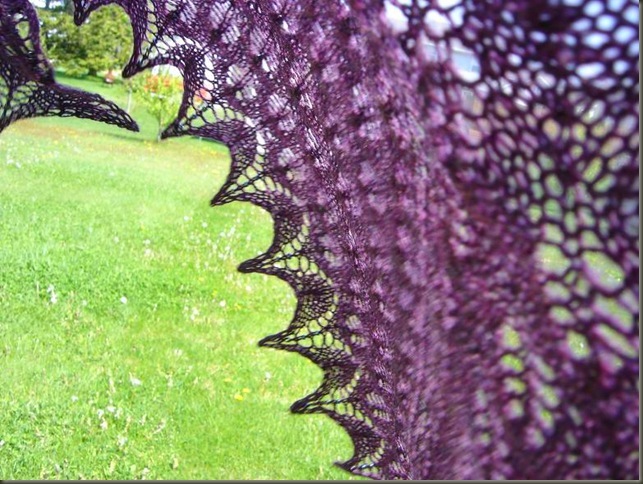 I had wondered if maybe I should have used larger needles to get a more airy feel to this shawl. As usual though, the magic of blocking evened out balance, and I think it feels just about right. 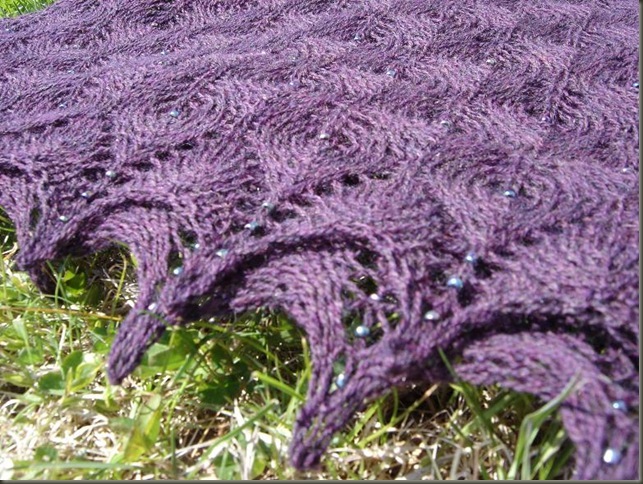 The finished shawl is light but still has enough substance to warm up the wearer. I am always amazed at how much warmth a light shawl can give. I think it's kind of like afghans. How can something so full of "holes" trap so much heat next to the body? Must be one of those life mysteries ;) I hope that the person I made this for will feel good when she wears it. I tried to think kind and comforting thoughts as I knit along, so I like to think that maybe those good vibes will go along with her wherever she goes. Positive Energy is Good Medicine in itself.